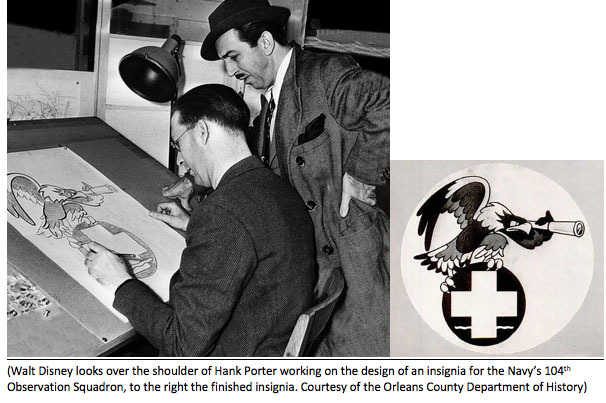 One of the unsung heroes of Disney’s WWII efforts is artist Henry “Hank” Porter who was a one man designer of many emblems and insignias during World War II. Porter was from the small town of Albion located in upstate New York west of Rochester. After graduating from high school, he went onto to study at the Chicago Academy of Fine Arts for his formal art training. When Porter completed his studies in Chicago, he began his professional career as an illustrator and commercial artist first working for a newspaper in Albany, and then starting his own advertising/commercial art business in Buffalo, New York. He was in Buffalo for nearly eight years and towards the end of that stint he had applied to the Disney studios in March 1936. He was invited to a tryout session at the RKO Building in New York City on April 15, 1936. Porter was hired by Disney on June 16, 1936 and then moved with his family to Los Angeles to work at The Walt Disney Studios (see footnote 1 below). Porter eventually moved on to be a staff artist in the Disney Publicity Art Department where he drew some of the Sunday comic pages for Snow White and the Seven Dwarfs and Pinocchio. But it was during the WWII era at Disney that Porter is noted as one of the most prolific artists at the studio. He is credited with creating more than a thousand insignia and emblems for the various branches of the military, other US Government agencies and charity organizations involved in the war effort. By far, the insignia designs were the biggest requests that came into the Disney studios during that period. 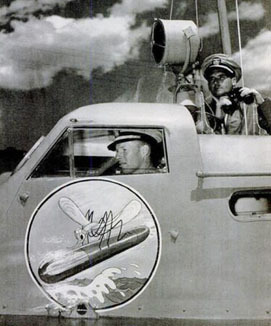 The written requests may have begun in 1941 when Lieutenant E. S. Caldwell, then of the Naval Operations office in Washington (footnote 2), wrote to Walt Disney asking for an emblem for the fleet of PT (patrol torpedo) boats, similar to the now famous PT-109 skippered by a young Lieutenant John F. Kennedy. 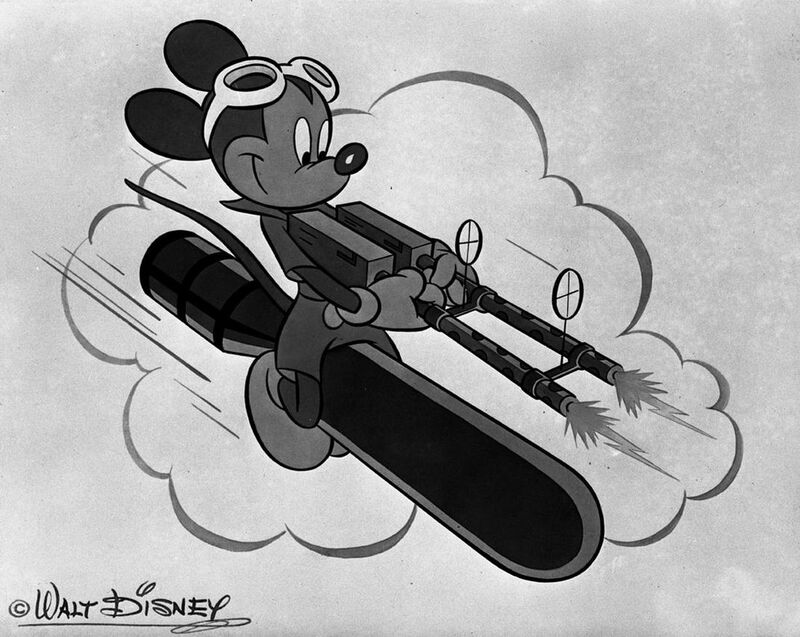 Disney responded within days with a design of a mosquito-on-a-torpedo insignia. The image, created by Hank Porter, of a little mosquito, streaking through the water with a sailor’s hat on his head holding a torpedo between its “many legs, made such a hit that every torpedo boat in the fleet soon had a Disney mosquito.” (footnote 3) The emblem was placed on the side of the charthouse where the boat was piloted from. After that, the Disney studios was inundated with insignia design requests for every military unit imaginable. Disney had assigned two artists, Roy Williams and Hank Porter, fulltime to satisfy the demands. Eventually two other artists were added to help , George Goepper and Van Kaufman (footnote 4). Before the U.S. even entered WWII, the Disney studios had produced hundreds of insignia designs. 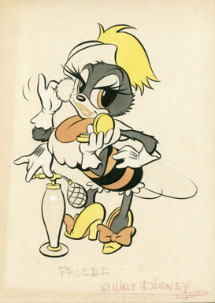 In 1944, members of a California based U.S. Navy Construction Battalion, most commonly known as the Seabees, wrote to the studio asking for a “deliciously feminine queen bee, with rosebud lips, dewy bedroom eyes and an atomizer to make her deadlier than the male” who carries only a Tommy gun (footnote 5). From that description Porter created Phoebe the female Seabee. Porter not only spent time coming up with the concept for an insignia, logo or emblem, he then designed it. Often he created a water color version to give an indication of the color palette. It is the equivalent of a visual development painting or color script in animation terms. One of my favorite original paintings is The Rock Submarine Base at Pearl Harbor completed in 1945. 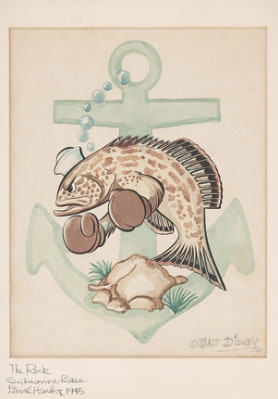 The insignia has a striking image of a Rockfish, also known as a grouper, in sailor’s hat with boxing gloves on its’ pectoral fins. Porter was able to take a fish and give it anthropomorphic qualities that appear perfectly natural and well proportioned. The Rockfish has a tough-guy attitude that conveys the message he’s ready to fight. The painting is finished off with a Walt Disney signature done by Porter. Original ink and watercolor of The Rock – Submarine Base – Pearl Harbor, 1945, which refers to the World War II Pacific Submarine Force based at Pearl Harbor, HI and tasked wreaking havoc on Japanese shipping and troop transports. Photo courtesy of Hank’s Auctions. 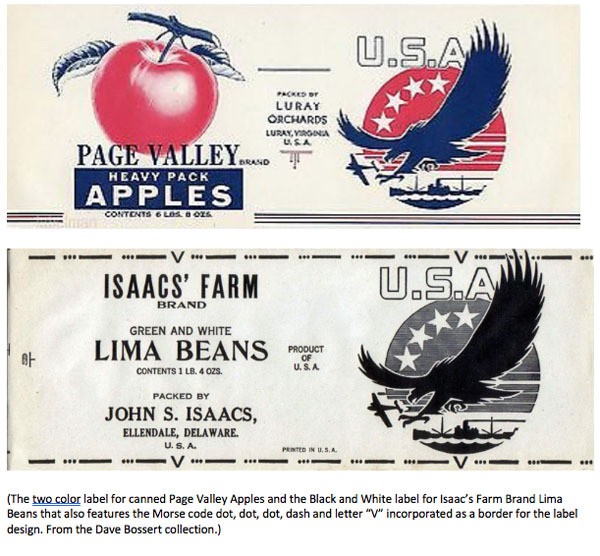 The Lend-Lease food emblem was used on packaged food and cargo containers to identify anywhere in the world that the containers and individual labeled products were from the U.S. The emblem signified the economic might and generosity of the United States during one of the darkest periods in world history. On January 28, 1942, Walt Disney presented the newly created Lend-Lease food emblem to the then to Secretary of Agriculture Claude R. Wickard. The emblem features a large silhouette of an eagle “poised on guard above a cargo ship” (footnote 8) and fending off an enemy bomber. 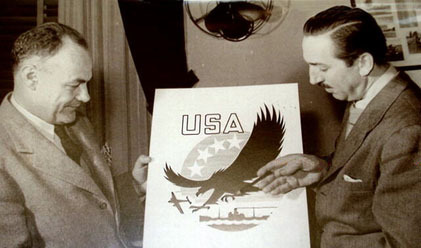 Roy O. Disney, Walt’s brother, suggested the use of the eagle as part of the emblem. The four stars on the emblem represent the four freedoms pledged in the Atlantic Charter and later after the war by the United Nations. The stars symbolize freedom of speech and expression, freedom of every person to worship God in his own way, freedom from want, and freedom from fear (footnote 9). The emblem was made available for voluntary use by food packers and appeared in black and white, monotone color and two color. Additionally, a number of dairy producers incorporated the emblem on milk bottles and added the letter “V” for victory to its bottles. Some of those bottles, as well as food labels, also carried the dot, dot, dot, dash Morse code symbols for the letter “V” reinforcing the victory mantra. The Walt Disney Studios produced more than 1200 insignia and countless emblems and logos during WWII adorning every kind military vehicle, tank, planes, boats and ships. These insignia used many of the characters in the Disney stable and newly created ones. The images were made into decals, patches and iron-on transfers. They were modified for use on signage, published pamphlets, graduation programs and even mass produced matchbook covers and stamps. The insignias were symbols that boosted moral giving specialty military units an identity, more often than not a whimsical one. It also instilled in the men and women serving in those units a sense of pride and dignity. All of these insignia were produced at no charge for the U.S. military. To Walt Disney, Hank Porter was often referred to as “the one-man art department.” Aside from having produced the bulk of the Disney insignia, Porter was one of the few artists at the studio who was authorized to reproduce Walt Disney’s signature for autographs. All of the insignias that Porter created are signed by him using Walt Disney’s name. It is also believed that Porter was responsible for crafting the iconic “looping D” that adorns Disney’s signature. I have often wondered if Porter would have stayed on at the studio for decades like many of the other Disney legends or would he have transitioned into Imagineering like some did to work on Disneyland. Sadly, we’ll never know, Hank Porter’s career did not last long enough to see where it might have taken him. Porter passed away on October 7, 1951 of cancer at the age of 50. An untimely death for an artist who was hitting his artistic stride and had already made a significant contribution to the Disney studios. His body was buried next to his mother at the Mt. Albion Cemetery in his hometown of Albion, New York (footnote 10). 7. Lend-Lease Act, Congressional Record. BTW…The artist Roy Williams, mentioned in the above story, is the same Roy Williams that was one of the adult mouseketeers on the Mickey Mouse Club TV show. IIRC, Mr. Williams would do some drawing/sketching now and then on the program. I was waiting for someone else to point this out: Its “citing”, not “sighting” in paragraph three. This was terrific, Dave – especially since I once did a little research myself (back when the town library was the only resource) on Hank Porter and his insignia designs, and even had one of those little ‘albums’ filled with stickers of dozens of his insignias. I actually saw one of his ORIGINALS, on display in an admin building at Ft. Hood, TX. It was big – maybe 24″x30″ – and a terrific painting of a crafty-looking black cat, under a ladder, with a broken mirror, under an umbrella, with a spilled salt shaker . . . done for the 13th Armored Division – the BLACK CAT Division! Thanks for all the research you did! Hi Dave, I appreciate your note. It’s always impressive to view original artwork of insignias and amazing how beautiful that art looks after all these years. Thanks for sharing! Great article Dave on my favorite Disney artist! I am currently writing Porter’s biography. I have been researching the man and his art for around 10 years now. Porter was hired as an in-betweener, but he suffered a relapse of an eye condition that had a negative impact on his vision, and when it was determined that the light from his animator’s board may have caused the relapse, he was moved into the Publicity Art Department, where he excelled. I was able to interview at length two of his three surviving children, and the grandson of his third deceased child. The family generously shared with me images they have of art their father/grandfather kept, in addition to letters, early family photos, and many examples of pen an dink illustrations Porter created from his youth and from when he ran his own commercial art studio in Buffalo. I have around 1,000 images of art Porter created and it runs the gamut: poster and lobby card, magazine illustrations, newspaper strips, company publications, presentation art, fan cards, corporate Christmas cards, WW II insignia and home front material, etc. 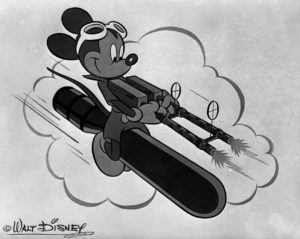 I have written one book covering Disney’s involvement in World War II and run a Facebook group called “Disney and the War” that explores this fascinating chapter in the studio’s history. Besides Porter, I also have a large cache of material related to artist Van Kaufman’s Disney-themed insignia contributions. Hi David, Wonderful to hear that you’re working on a Hank Porter biography. Also, I appreciate your help on filling in some of the details for my above article. Porter is certainly one of the unsung heroes at Disney. Thanks again for your gerousity in collaborating on aspects of Disney and the WWII period. Hank Porter was my grandfather. I never knew him since he passed away when I was 17 mos old. I’ll bet you were the person my mom told us about, that was researching her dad. Unfortunately, I didn’t take notes when she would tell us about him and I only remember bits and pieces. Thanks to my cousin Ann for posting the article cartoonresearch it was very informative. After reading your post, I can’t wait for your book. I will make sure my kids read the post and pass it on to my grandkids. Let us know when you get your book finished. Thank you! Great piece David. I think I may have an answer to your question on if my grandfather would stay at Disney. I owe you some other information but love seeing your work!